Learning from Boston and other innovators. The complete streets movement is coming of age, making this a good time to take stock. Now 10 years old, complete streets policies came into being in late 2003 in response to car-centric planning. The term "complete streets" was coined by America Bikes as it was developing a new policy initiative with the goal of ensuring the same rights and safe access for all users of streets, including pedestrians, bicyclists, motorists, and transit riders of all ages and abilities. Common features include ample sidewalks, improved standards for street tree planting and other landscape elements, bike lanes, dedicated bus lanes, comfortable and accessible transit stops, frequent crossing opportunities, median islands, and curb extensions. The movement spread rapidly. The National Complete Streets Coalition was formed in 2005; its founding members included the American Planning Association as well as America Bikes, Smart Growth America, and others. By the end of 2012 there were nearly 500 complete streets policies in place nationwide, according to an analysis by Smart Growth America. Though some of these policies are simply single-page ordinances, others are comprehensive guidelines. In addition, in the past decade, "complete streets" has become part of the lay vocabulary, not just a term used by transportation planners and streetscape advocates. In addition to Boston's Complete Street Guidelines, San Francisco's Better Streets Plan (2011) and New York's Street Design Manual (2009) are some of the most comprehensive. Chicago (Complete Streets Chicago, 2013), Atlanta (Connect Atlanta Plan/Street Design Guidelines, 2013), Portland (Portland Pedestrian Design Guide, 1998), and other big cities likewise offer good examples, as do midsized cities such as Minneapolis (Access Minneapolis, 2008) and Louisville (Complete Streets Manual, 2007). College towns such as New Haven (New Haven Complete Streets Design Manual, 2010) and Charlotte (Urban Street Design Guidelines, 2007), in particular, have passed ordinances that have made complete streets the cornerstone for streetscape design and implementation. With remarkable speed, Boston and cities across the country have embraced the concept of "street as space," thereby making more effective use of streets, their largest real estate asset. Recognizing that 56 percent of city-owned lands are in the public right-of-way, the Boston Transportation Department in 2008 defined a set of aspirational complete streets goals that went beyond multimodal accommodation to emphasize green infrastructure and advances in streetscape design made possible through technology such as the use of structural soil to extend the life of street trees and the use of sensors to provide real-time information on parking availability. Subsequently, BTD spent more than three years working with two consultants, Toole Design Group and Utile, Inc., to develop graphic guidelines, while also implementing tangible pilot projects. 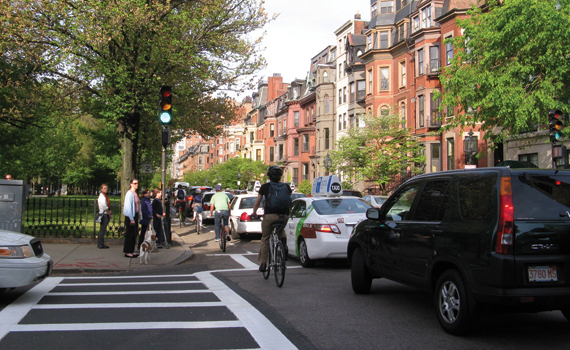 This dual approach was to make real — through compelling visuals and visible changes to streets throughout the city — the three core principles of Boston's Complete Streets Guidelines: multimodal, green, and smart. Although they were completed less than a year ago, there has been sufficient time and work to identify both the precedents and descendants of Boston's guidelines. Boston's approach placed strong emphasis on graphic representation, but through illustration. The conventional approach has been to appropriate photographs from other cities — often from overseas — to illustrate "best practices." San Francisco's Better Streets Plan and New York's Street Design Manual are good examples. These cities rely heavily on the use of photographs, while creating a framework that is clear, compelling, and cuts across jurisdictional boundaries. Boston, however, developed three-dimensional perspective illustrations, along with the occasional photo, that placed streetscape elements in a context with an unmistakable Boston flavor. The city also recognized that the Federal Highway Administration's classification system for streets (locals, collectors, and arterials) was insufficient for urban environments. Consequently, Boston identified a novel set of urban street types — such as "downtown mixed-use" and "shared streets" — that supported complete street strategies. These techniques — along with a web portal for real-time feedback collection, even before formal adoption by the city — have been embraced by other cities and national organizations. The National Association of Transportation Officials recently used similar graphic conventions for their Urban Street Design Guide and made their website the primary conduit for distribution of their guidelines. Boston's website was designed to function as an educational tool for cities across the world, a virtual space where diverse audiences could explore the tenets of complete streets design, monitor development of the guidelines in real time, and view proposed and real projects. Not so different from emerging planning tools like MindMixer or Streetmix , the website was intended to make the process tangible, transparent, and engaging. Currently, an interagency group is formalizing a framework for implementation. The three pillars of Boston's complete streets design help to demonstrate complete streets thinking in the past, present, and future. Multimodal: Boston is naturally a walking city. It has one of the highest mode-splits for walking in the U.S., but, in keeping with national trends, the city also has seen a dramatic increase in bicycle use. Bicycle ridership has doubled since 2007; the city has added more than 80 miles of bike lanes; a bicycle-share program, "Hubway," was launched in 2011 and has expanded every year since; a bicycle network plan was adopted; and the first helmet vending machine in the U.S. was introduced. The most challenging aspect of accommodating bicycles has been respecting and hybridizing new concepts within Boston's historic urban fabric. The left-side bicycle lanes next to the Commonwealth Avenue Mall are excellent examples. Foregoing the right-side bike lane convention, pedestrian and bicycle accommodations were colocated down the center of Commonwealth Avenue, one of Boston's most picturesque avenues. Though controversial when introduced in 2012, this anomalous bike lane is now an accepted feature of Boston's Back Bay. More recently, Boston was awarded a $15 million grant from the FHWA for Connect Historic Boston, an initiative for which the city and the National Park Service have partnered to connect transit to Boston's history. Still basking in the Boston Red Sox 2013 World Series win, the city also has just completed the new Yawkey commuter rail station, which will bring commuters, residents, and visitors within a five-minute walk of Fenway Park. This will replace a dilapidated platform with limited service. Built with state funds, this accessible commuter station will serve people coming to the rapidly developing Fenway neighborhood — with peak service on game days. Green: Introducing more trees and "greenscape" elements into Boston's urban environment has established positive aesthetic, health, and environmental effects. Nevertheless, just a few years ago, Boston was putting down nonpermeable asphalt and planting trees in undersized tree pits. Today, the city is installing permeable paving systems, structural soil, and large tree pits (as specified in the Complete Streets Guidelines) that allow for proper ground water infiltration. It's all part of a comprehensive and systemic green strategy. One example is Peabody Square in Dorchester, where vestigial roadway was reclaimed as open space, and permeable sidewalks and rain gardens were installed. Created in tandem with a refurbished transit station, the reconfigured roadway not only improves traffic flow, but creates a plaza for outdoor cafe seating adjacent to new restaurants and housing. Green doesn't always have to mean landscape; another pilot program for parklets supports the seasonal conversion of parking into open space, supporting sustainability more broadly by offering an open space alternative to parking. 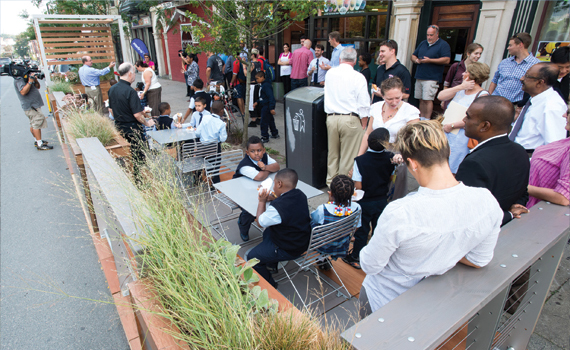 This program is expanding in 2014, concurrent with other parklet programs in cities across the U.S.
Smart: The decision to highlight "smart" as a core principle was Boston's way to differentiate its Complete Street Guidelines, but perhaps natural for a city whose ties to education, pragmatics, and technology are culturally entrenched. Peering into the future is never easy, but it has become clear that cities are entering a new era of complete streets design, as smart elements like electric vehicle charging stations, in-ground parking sensors, transportation demand management tools, and transportation-focused smartphone apps proliferate in Boston and in other cities across the country. "Smart" and "technology" should not be used interchangeably — being smart is in part about leveraging technology. Cities should be smart about how complete streets concepts can adapt to different environments, recognizing that a one-size-fits-all approach won't work. Making use of a city's best assets will yield the greatest success. Part of the larger emphasis on "smart city" design, new rideshare businesses like Uber and Lyft are changing transportation in expected locales like San Francisco, but also in cities like Houston, where cars are unquestionably dominant. As part of the sharing economy, these companies are already transformative, though cities and states are wrestling with the appropriate regulatory mechanisms. Complete streets can and will be part of this conversation, particularly as the conceptual underpinnings of "shared streets" naturally align it with the sharing of underutilized assets more broadly. As better, more adaptive streetscape infrastructure is put in place, we are likely to see growth in smart hardware in addition to less-visible software. The design and technology of cars, bikes, and their complementary rideshare programs will evolve. Concurrently, smaller scale innovations like smartphone-controlled bike locks are starting to emerge, in addition to larger scale advancements like induction-charged buses. These designs will create challenges that agencies and the guidelines did not anticipate. Both Boston and New York conceived of their design guidelines as living, evolving documents that can be updated regularly. Electric Vehicle Charging Stations support the adoption of a new generation of clean-fuel vehicles. Linked to smart electric grids that use alternative energy sources such as solar and wind, they will help reduce dependence on fossil fuels and combat climate change. Ease of Maintenance informs the design of roadways and sidewalks, favoring durable materials and maintenance agreements for special features to enhance the life and upkeep of Boston's streets. Accessible Surfaces with smooth slip-resistant materials for sidewalks and crosswalks create comfortable walking environments that make streets welcoming for people of all ages and abilities. Bus Lanes and Transit Prioritization at intersections improve the reliability of routes with high passenger volumes. Shelters with amenities and next bus information improve convenience for passengers. Intelligent Signals and Traffic Cameras manage traffic flow in real-time. They facilitate vehicle progression and reduce wait times, improving fuel efficiency and reducing GHG emissions. Permeable Surfaces for roadways and sidewalks help reduce flooding and erosion and preserve capacity in storm drains and combined sewers. Bicycle- and Car-Share Stations provide the convenience of personal transportation, low costs, and energy savings without the need for car ownership. Smart Meters that accept prepaid cards, payment by mobile phones, and allow for variable pricing facilitate more efficient use of limited curbside space. Minimum Lane Widths assist in the accommodation of pedestrians and bicyclists when the available public right-of-way is limited in width. Narrower roadways also result in safer vehicle speeds. Bicycle Lanes and Cycle Tracks create a citywide network that increases safety and encourages more people to bicycle. Rain Gardens and other greenscape elements at key locations divert stormwater directly to the soil. Maintainable rain gardens can filter pollutants, improve air quality, and provide greenery on the street. Digital Tags and Information Panels integrated with street furniture and building facades enable wayfinding, community bulletin boards, trip planning, and place-based social networking. Wide Sidewalks with unobstructed accessible pathways encourage walking. When combined with proper lighting, street trees, and vibrant street walls, they are inviting, safer, and contribute to placemaking. Street Trees with sufficient rooting volume to thrive provide shade and beauty, support wildlife habitat, and reduce air pollution and energy consumption. As the next version of complete streets comes into focus, one can expect implementation challenges despite public and interagency buy-in. And though complete streets can cost more depending on the proposed features, cities have an obligation to take the long view. A simple cost-benefit analysis of installing wider sidewalks and street trees might require more upfront capital costs, but this is not a sophisticated way of evaluating complete streets elements. Structural soils might be more expensive, but the operational costs over the long term will be lower as these trees will live longer and yield intangible benefits like shade, beauty, and improved air quality in cities. Early criticisms, such as retail businesses suffering from lack of adjacent on-street parking or the public being concerned about unmet vehicular needs, have been repeatedly debunked. Streets that attract diverse users are seen as a key to economic revitalization, despite the fact that there will inevitably be some who do not benefit. Cities have also learned that complete streets are not just about multimodal accommodations. Efforts to "green" the city are necessary complements; Chicago's Green Alleys program is one example of a city recognizing that better allocation of streets also includes landscape elements. Tactical urbanism, or temporary, low-cost interventions often achieved through paint and off-the-shelf items, has offered tremendous support to the complete streets movement, though typically not formalized in city guidelines. Helping to alleviate blight or simply improve an average street through temporary measures can have profound positive effects. Complementary to complete streets goals, but not necessarily under their auspices, advocates and city agencies should recognize and partner where appropriate to create streets that are complete in both conventional and unconventional ways. Perhaps the greatest takeaway from the first decade of complete streets is that people value choice. Not every street can provide the same level of service for all users, but a true complete street offers choices. Similarly, complete streets offer designers, planners, and engineers more tools in their toolbox for designing streets; technology is simply accelerating and growing the availability of those options. We've already seen how a decade of work can induce change; it's exciting to speculate what the future will bring. Corey Zehngebot is a senior urban designer and architect at the Boston Redevelopment Authority, and served as the project manager and creative director for the design of Boston's Complete Streets Guidelines. Richard Peiser is the Michael D. Spear Professor of Real Estate Development at the Harvard Graduate School of Design. It's certain that debates about health care will escalate this year as congressional elections draw near. But there's a new twist in the discussion that might bring people together: the simple fact that physical activity, especially walking, shows remarkable promise for improving Americans' overall health and reducing skyrocketing medical costs. Recent medical studies show that engaging in physical activity for as little as 30 minutes a day can prevent or help treat conditions such as diabetes, breast and colon cancer, depression, dementia, anxiety, osteoporosis, cardiovascular disease, obesity, and high blood pressure. More will emerge when the U.S. Surgeon General's office releases a call to action on walking, which some observers compare to the landmark 1964 Surgeon General's report on the dangers of smoking. The call to action was initiated by former Surgeon General Regina Benjamin, who was so impressed by medical data on walking that she added trails to her health clinic in rural Alabama. The project is being carried forward by interim Surgeon General Boris Lushniak. This growing attention to the role of walking also focuses on taking steps to make our communities more walkable, which positions city planning as a key element of the solution. Despite the interest of the surgeon general, the push for walking and walkability is not a top-down effort. A full-fledged walking movement is emerging, which made a high-profile debut at the National Walking Summit held last fall. The event attracted more than 375 participants representing 235 organizations from 41 states and Canada, ranging from the PTA to AARP, the NAACP, the PGA, the American Lung Association, and Marriot Inc. Key groups coordinating the movement include America Walks, a coalition of more than 400 locally based advocacy groups, and Everybody Walk!, a collaborative of organizations convened by the nine-million-member health care nonprofit Kaiser-Permanente. Bob Sallis, a family physician from Fontana, California, who spoke at the summit, says, "Walking is like medicine for my patients. ... If walking was a pill or medical procedure it would be on 60 Minutes." Side effects, he adds, may include weight loss, improved mood, better sleep, and stronger bones. Biking, jogging, dancing, swimming, gardening, aerobics, or playing sports will also boost your health, Sallis notes, but walking stands out as the most appealing and easiest exercise for most people. There's no cost, and it doesn't require special clothes, equipment, or facilities. Walking is the nation's favorite physical activity, according to a Centers for Disease Control and Prevention publication, with six in 10 Americans walking for at least 10 minutes in the previous week. Adults walk six percent more often than in 2005, and walking for transportation accounts for a surprising 11 percent of all daily trips, according to the U.S. Department of Transportation. This includes 35 percent of trips to work, 40 percent to stores, and 46 percent to school or church if these destinations are within one mile of home. These statistics drive home the point that better health is linked to creating more walkable communities. Still, 52 percent of us don't get the recommended minimum of 150 minutes of physical activity a week (double that for children), according to the CDC. Rates of inactivity are higher for women, seniors, and residents of the South and Midwest. The aim of the walking movement is to get Americans back on their feet by encouraging us to make a habit out of taking a morning or evening stroll, walking the kids to school or sports practice, organizing a lunchtime hike with coworkers, or spicing up our weekends with a jaunt around town. But this depends on how safe, comfortable, and convenient it feels to walk in our communities. A host of factors — from vehicle speeds and fear of crime to the prevalence of sidewalks and mixed use developments — affect how often and how long people will walk. Jay Walljasper — author of The Great Neighborhood Book — writes, speaks, and consults about how to create stronger communities. His website is www.JayWalljasper.com. Images: Top — Left-side bicycle lanes on Commonwealth Avenue are one example of how Boston balanced new concepts with the city's historic urban fabric. Photo courtesy Boston Bikes, www.nostonbikes.org. 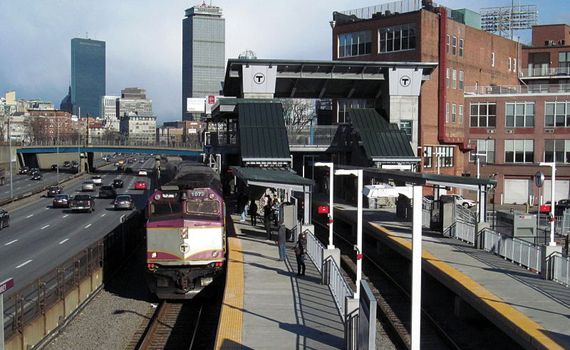 Middle — Expanded service and newly renovated Yawkey commuter rail station, which is within a five-minute walk of Fenway Park, will serve Boston's rapidly developing Fenway neighborhood. Photo WikiMedida Commons. Bottom — Boston's parklet program offers an open space alternative to parking. Parklets are seasonally converted parking spaces that are enhanced with landscaping, seating, or other design elements. Photo courtesy Boston Transportation Department. The Collaborative Lab, Rachel Botsman's "innovation consultancy," defines the sharing economy as an economic model based on sharing underused assets from spaces to skills to stuff, for either monetary or other types of benefits. Botsman is the coauthor of the 2010 book What's Mine Is Yours: The Rise of Collaborative Consumption. Do complete streets cost more? That question was addressed by James Shapard and Mark Cole, senior engineer and design section manager, respectively, in the Charlotte (North Carolina) Department of Transportation. Their presentation at the Transportation Research Board's 2013 annual meeting was called "Do Complete Streets Cost More than Complete Streets?" The Victoria Transport Policy Institute has weighed in with Evaluating Complete Streets: The Value of Designing Roads for Diverse Modes, Users and Activities. One of its conclusions: Three groups are worse off in the complete streets movement: motorists who want to drive faster, urban fringe residents and property owners, and local merchants who rely on street parking. For more about Uber, Lyft, and other rideshare services, see "Not Your Daddy's Taxi" in Planning, May/June 2013.